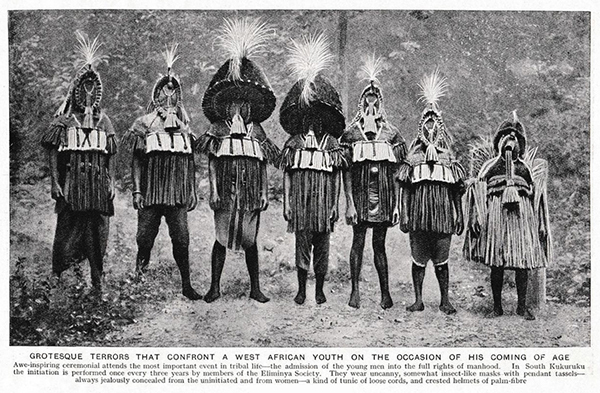 N. W. Thomas’s photograph of Eliminya masquerade costumes as published and captioned in Peoples of All Nations in 1922, and The Secret Museum of Mankind in 1935. This is the first in an occasional series of guest blogs for the [Re:]Entanglements project by Jean Borgatti. Jean received a PhD in Art History from UCLA in 1976. She has carried out research in Nigeria among Edo-speaking people north of Benin for over 40 years, beginning in the 1970s, returning in 2003-04 and 2014-16 on Fulbright-Hays teaching/research fellowships with a base at the University of Benin, Benin City. She has carried out research among a number of small ethnic groups with which N. W. Thomas interacted, notably the Okpella (Ukpila), Ekperi, Weppa-Wano, Avianwu, Uzairue, Otuo (Otwa), Ogbe and Ibillo, publishing on the Okpella, Ekperi and Otuo masquerade complexes in the journal African Arts. In this blog, Jean recalls her encounter with a photograph by Northcote Thomas reproduced uncredited in a 1935 publication entitled The Secret Museum of Mankind, and how this led to her own documentation of the same remarkable Otuo masquerade in the early 1970s. So reads the caption to this heavily modified photograph, published in 1935 in The Secret Museum of Mankind – a work described on the website at which it has been digitized, as a ‘mystery book’, with ‘no author or credits, no copyright, no date, no page numbers, [and] no index’ (http://ian.macky.net/secretmuseum/). Advertised as ‘World’s Greatest Collection of Strange & Secret Photographs’, its accompanying texts ‘read like the patter of a carnival sideshow barker’, racist and sensational (ibid.). 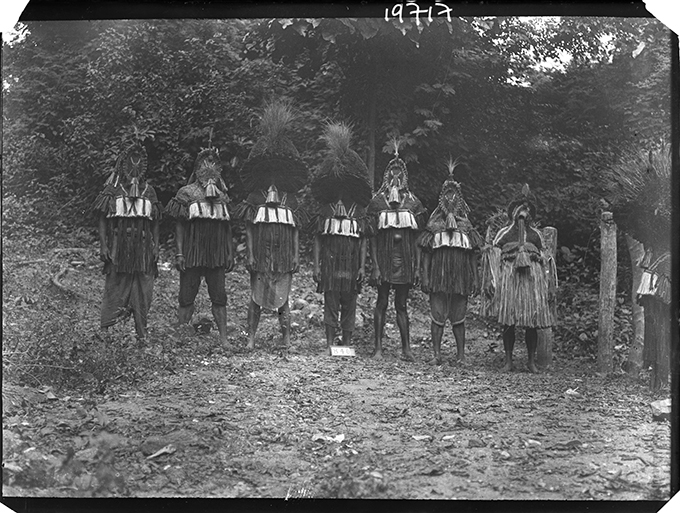 N. W. Thomas’s original photograph of the Eliminya masquerade costumes, taken in Otuo in July 1909 (NWT 840). 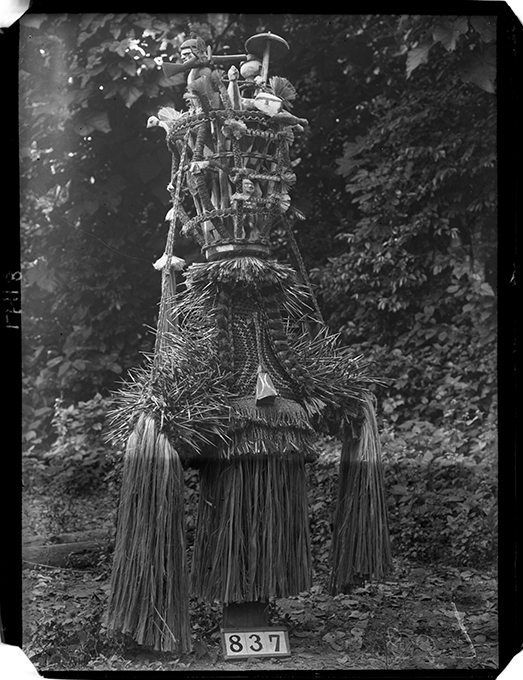 Scanned from glass plate negative in the Royal Anthropological Institute’s collections (RAI 400.19717). Like other images in the book, the photograph is not attributed in The Secret Museum of Mankind. We know, however, that it is one of Northcote W. Thomas’s photographs taken in Otuo (Otwa) in July 1909, in the north of Nigeria’s Edo State, of a festival he records as being called ‘Eliminya’. The photograph and the caption had previously been published in 1922 in a serialized illustrated encyclopaedia entitled Peoples of All Nations edited by J. A. Hammerton. N. W. Thomas provided numerous photographs to sections on the ‘British Empire in Africa’ and contributed an article on the ‘manners and customs of its native races’. Both Peoples of All Nations and The Secret Museum of Mankind were published at a time described by Annie Coombes in her book Reinventing Africa (1997) when Africa was a concept as much as a geographical destination. She notes that the Africa that existed in the popular European imagination was an ideological space, at once savage, threatening, exotic and productive. These ideas are reinforced by the images and captions published in popular works such as Peoples of All Nations and The Secret Museum of Mankind. At this time two particular cultural arenas effectively disseminated knowledge of Africa to the European public: the displayed classification of material culture from Africa in ethnographic collections in local and national museums (such as the collections made by Northcote Thomas and now in the University of Cambridge Museum of Archaeology and Anthropology), and the spectacle of Africans themselves in a variety of large-scale national and regional exhibitions. The popular illustrated press and serialized encyclopaedias such as Peoples of All Nations were also part of this dissemination, and, as mentioned above, this material was later republished in works such as The Secret Museum of Mankind. I recognized the photographs when I obtained a second-hand copy of The Secret Museum of Mankind in the early 1970s, having earlier seen copies of some of Northcote Thomas’s photographs. These had been made from the album lodged in the National Museum in Lagos and provided by a colleague, since at that time I was considering whether to make an art historical field study in the Edo North area (known in Thomas’s time as Kukuruku). I spent some time in the UK at the Cambridge Museum of Archaeology and Anthropology, where I was given access to Thomas’s collection – although it was not well catalogued, stored or described at that time. I pursued a field enquiry in Edo North between 1971 and 1974, witnessing the festival described by Thomas as Eliminya in Otuo (Otwa) in 1973. (When I visited the festival was called Igugu.) Although this was not my primary research, after witnessing this extraordinary masquerade spectacle I did some follow up work and wrote an article on Otuo’s age grade masquerades, published in African Arts (Borgatti 1982). 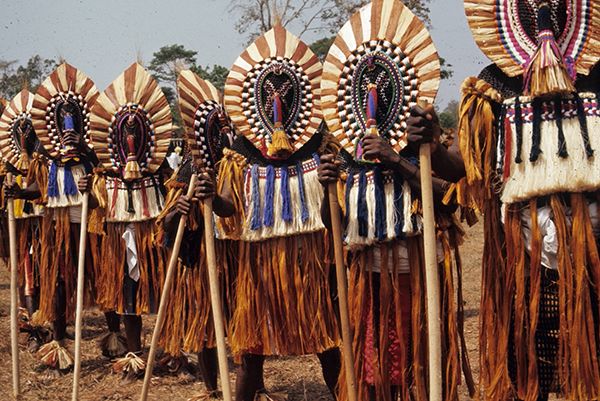 Otuoyema group masqueraders in fibre costumes, Otuo, 1973. Photograph by Jean Borgatti. I had been fortunate in 1973 to document a particularly important group of men who served as sponsors for the masquerades as they moved into what was described as the lower levels of leadership. They were men between 40 and 50 years of age in the Otuoyema age group. Otuo requires that its citizens participate in the age-grade system, even if that participation is by proxy, moving up systematically through the ranks. If a man does not participate, he may never become a chief in Otuo – no matter how successful he has been in the outside world. This seems to have provided considerable incentive for people to support the age-grade institution. Otuoyema group masqueraders wearing headdresses of raffia velvet, Otuo, 1973. Photograph by Jean Borgatti. 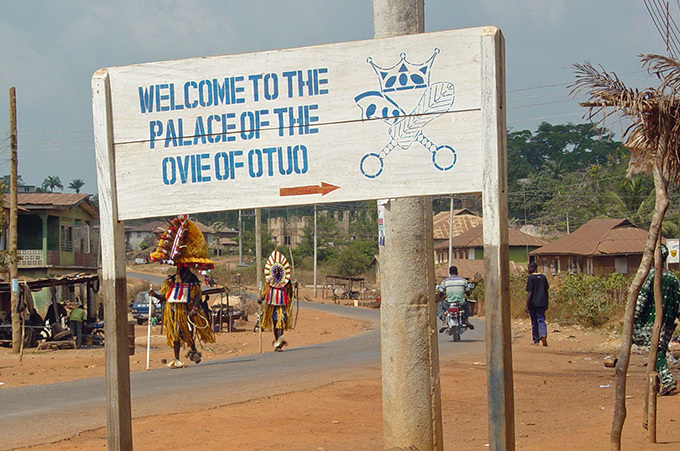 I returned to Nigeria in 2002-03 on a Fulbright-Hays Research and Teaching fellowship that enabled me to follow up on the Otuo (and neigbouring Ikao) festival. During the festival, I was the guest of the paramount chief of Otuo, Ovie Julius Elugbe, who had been one of the initiates in 1973. 2003 was a year during which age sets moved up, so new masquerades had to be made and the displays were elaborate, though not as elaborate as in 1973. 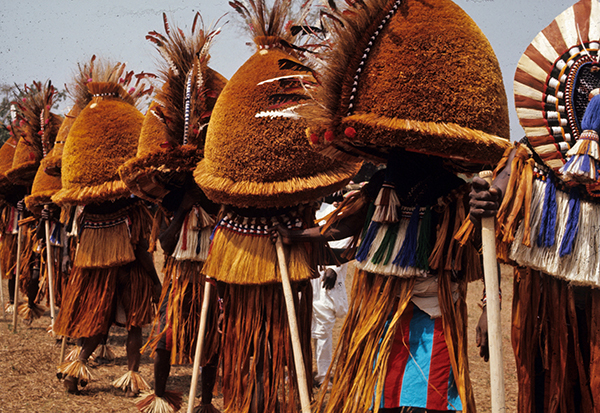 Large masquerade (Ugbokpa), sometimes called ‘umbrella’, followed by a smaller, flat ‘whipping’ masquerade (Olu) moving from playing ground to playing ground at the beginning of the festival. Igugu/Eliminya Festival, Imakhize Village, Otuo, January 12, 2003. 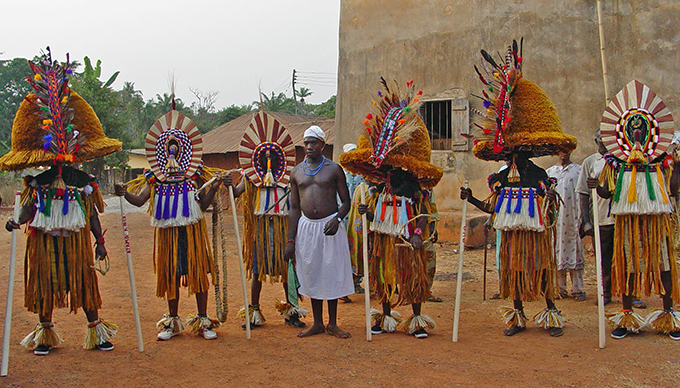 Ugbokpa and Olu masquerades in Uzawa Village playing ground with age company member. Igugu/Eliminya Festival, Otuo, January 12, 2003. Subsequently, in 2016, I photographed the festival again, this time in the company of the linguist, Professor Ben Elugbe, the late Ovie’s nephew. 2016 was not a year for age-grade formation, since this occurs only once every five years when the new masquerades are introduced (in contrast to Thomas’s assertion that it occurred every three years). In between times, the fibre masquerades, if not those with carved wooden headdresses, come out annually in their respective quarters, going to each village square or playing ground to dance. According to Professor Elugbe, there are eighteen distinct playing grounds today. If no one is there to beat the drums for the masquerades when the arrive, they may just walk around and go on to the next playing ground. Large masquerade (Ugbokpa) arriving at playing ground in Oluma Village. Igugu/Eliminya festival, Otuo, January 1, 2016. 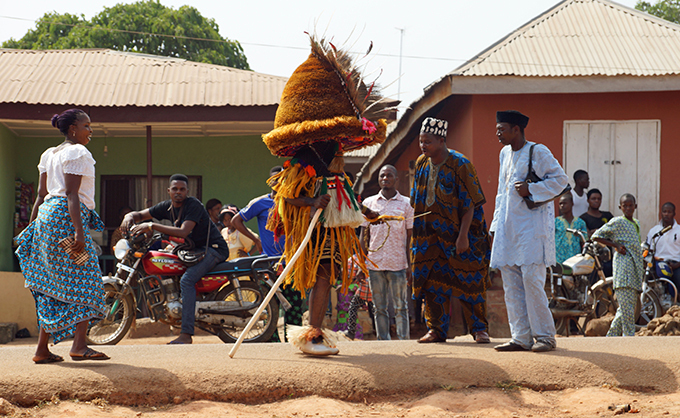 Small masquerade (Olu) performing to the beat of the drum (odoka) in Oluma Village. Igugu/Eliminya festival, Otuo, January 1, 2016. 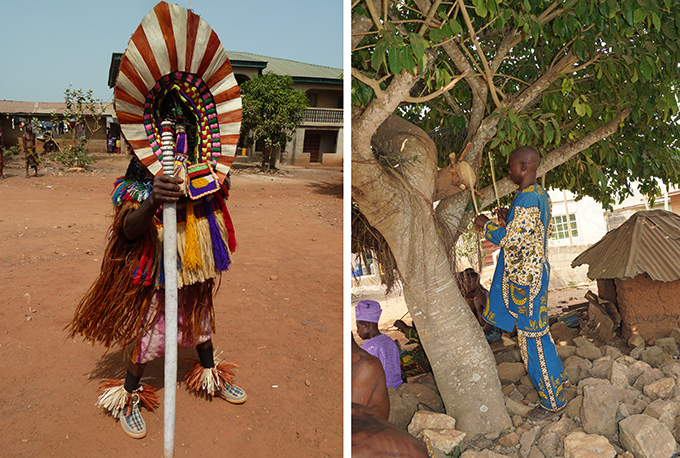 Even though Thomas’s photographs provide an important visual baseline for Otuo’s cultural practices, much work remains to be done in these northern Edo communities that are struggling to conserve their remarkable heritage.